The first two weeks of the Summer Camp 2018, held at the Sport and Fitness Centre, University of Birmingham, not only have they flown past but they have also been a massive success. Kristian Roebuck in week 1, along with Julia Mann. Lorraine Cole was overseeing all of the sessions. Week 2, Lorraine and Dave Prior ran the sessions. Week 3 of the Summer Camp 2018 sees Fontaine Chapman (recently married so now Wright), taking grip of the situation hopefully smashing it.Julia Mann is back along with Lorraine Cole. To date between 34 and 39 players have taken to court most days of the Summer Camp 2018. Most sessions see at least 6 coaches in the room giving the players help and advise on techniques, movement, tactics. With still two weeks to go if you are luck and don’t want to miss out there are still a couple of places left. See HERE for full details. West Midlands Summer Camp 2018 – Where players just get better. Who’s excited about the Summer Camp? With just over a week to go players and coaches are getting excited about the Summer Camp. Some players are travelling from west of the country Wales and east of the country Norfolk to attend the West Midlands Performance Centre annual Summer Camp. Guess coaches are lined up to for three out of the four weeks, each bringing their own individual skills and knowledge for the sessions they are running. So each week will be different. Although the sessions will cover singles, doubles movement and tactics, there will of course be technical training for techniques. At the end of the day players will walk away with better skill and techniques and more knowledge. All this is hosted at the fabulous Sport and Fitness Centre, University of Birmingham, B15 7TT. Fabulous facilities and the main hall has 12 badminton courts. Excitement is rising with 10 days to go. Although the deadline hascome and gone there are odd places left. The WMPC Summer Camp 2018 is just over six weeks away…..Can you believe it….? It has been almost a year since the August 2017 Summer Camp and now it is six weeks away. Hopefully you have got your places booked on to the three days of four weekly training sessions. Each day consists of four hours training, guaranteed to tier you out and make you ache………..BUT more than anything it as the PC’s logo say is ‘Where badminton players just get better’. For full details and booking forms Click HERE. So in six weeks time are you going to be there? If not why not? You do know it makes sense! Last year saw players from as far as Gwent, Norfolk, Lancashire and Essex. We have had at our Whitsun Camp, players from Cornwall and Wales so it must be good if they are coming back. Some of the term’s news and results are highlighted in the West Midlands Performance Centre’s Newsletter the ‘WMPC Times’. The WMPC Times is written by editor Peter Clegg. One of the coaches and players at the Performance Centre. Talking to the players he takes their information and re-lives it on paper so that other members of the PC can join in their success. 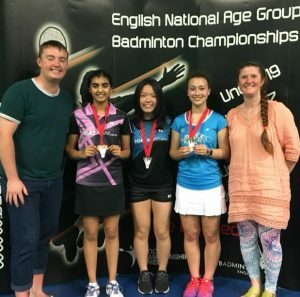 This term sees lots of success for Asmita Chaudhari in the U19 National Championships. Kiara Henry in the Surrey U17 Gold and Sana Sibal on the U13 Bronze circuit. See all the details in this half-term’s WMPC TIMES. If you have entered your first tournament OR had have your first success at a tournament, your experiences and you views on the competition and it results are items of interest to all. Then why not get them published in the next issue of the WMPC Times. Medals weekend for young WMPC player Toby Beckett. Young Toby Beckett had a fabulous medals weekend after participating in two different Under 15 tournaments at the weekend. Saturday 3.3.2018 – u15 Bronze. MENS SINGLES – His family ploughed through the snow to the Warwickshire Under 15 Bronze tournament. After getting out of his box and winning in the first round of the knock-out he was through to the semis. He faced his doubles partner Harry Jones. Toby pushed hard winning. Toby lost in the final giving him his first ‘medals weekend’ treasure in the form of a Silver medal. MENS DOUBLES – Toby played with Harry, to go successfully through two knock-out rounds and saw them in the final. Tough final, but Toby and Harry took the game, giving Toby his second ‘medals weekend’ treasure a Gold medal. Sunday 4.3.2018 – U15 Bronze Hertfordshire. MENS SINGLES – Straight through the box, narrowly missing playing his doubles partner. Three knock out rounds to see him through to the final. Winning 21-16, giving Toby this third ‘medals weekend’ trophy with a Gold. MENS DOUBLES – Toby and Harry got out of their box, only to meet the number one seeds and unfortunately they proved a little to strong for Toby and Harry. Under 13 Bronze tournament March 2018 was heavily threaten by snow building up to the tournament date of 4th. The ‘siberian beast’ nearly caused a casualty. With a heavy entry of around 65 players all under 13. Bad weather was forecast but with players travelling from as far away as Cornwall, Nottinghamshire, Buckinghamshire and Yorkshire, West Midlands PC were reluctant to cancel. Most folks set of earlier that normal to make the journey there. The a full on day of badminton was seen and all done by the time the centre close at 6.00pm. A couple of ‘Thank you’s go to Richard Jones (Connor’s dad) whos help behind the desk and keeping the score board up to day, massive help. Uma Reddy (Akash’s dad) on suttle control, keeping you guys in order and limiting the knocks. AND of course young Sam White (a PC coach), it was his first tournament behind the desk. That aside we got through approximately 170 games yesterday without any major problems. An almost close injury, couple of scoring disputes and line call queries, but nothing major. A few tears here and there, but soon forgotten. So a relatively easy day in that respect. The WMPC saw the following medals for their players. Well done to all the PC’s up and coming stars for participating in the event. FYI – Parents. The Tournament Organisers job can be made so very difficult, IF, you don’t let them know your arrival times OR when you leave the building during a break in your play. We are always willing to help and accommodate IF we know. Communication is the key. 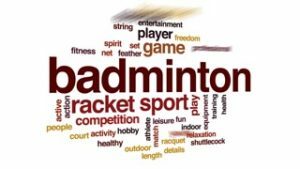 FYI Badminton player…….April 2018 Badminton camp over Easter. Due to the success of previous badminton camps , the West Midlands Performance Centre is running badminton training during April 2018, over the Easter break. The new Sport and Fitness Centre, at the University of Birmingham is the fabulous venue where the training takes place. Two hours in the morning with a break to recuperate and re-fuel, ready for the afternoon session. If you enjoyed the last one the bookon to this one and why not bring a friend or your doubles partner. Several coaches will be in the hall to deliver the daily programme to the various smaller groups during the day. All the details can be found HERE along with booking forms. Places will be limited so get in quick. Booking deadline is 28 March 2018. Second match and we play Tudor Grange sees four PC members turned up early at the second of the Solihill Junior League games and a different venue from the first match. Raring to go we picked the court for the evening. We were one of the first teams there so we waited patiently for the opposition. Tudor Grange’s team manager walked straight over to say hello, fellow self employed coach, Steve Kiernan who I had not seen for a couple of years. So we did a bit of catching up whilst the boys knocked up and we filled the score sheet in. Down to business and Ethan and Toby went on for their first game. Best of three games and with a comfortable opening game beating the Tudor grange first pair in two games to take the rubber. Then Charlie and Joe took to court. Not quote such a fast start but once they got going a good game, settling in nicely. Again in two games to give us two rubbers. There pairings stay the same for the second round but our second pair play the first pair from Tudor. Grange and vice versa (our first play their seconds). Mot quiet so comfortable but we came though the second round of games unscathed, with another two rubbers. Third round not quiet as easy. The pairing changes (as per the format) and our no. 1 player pairs up with our 3rd player, whilst no. 2 plays with no. 4. Now on two courts al four players took to court. Toby and Charlie made light work of the opposition moving them around and generally putting them under pressure. Joe and Ethan won the first game but the opposition fought back in the second taking the game 22-20 to Tudor Grange, one game all. Sorted themselves out in the last game to give us an overall win on rubber 6-0. Well done guys here’s to the next one. Week ONE of the Summer Camp, at the University of Birmingham’s NEW sport and fitness centre, proved to be a SMASH HIT for the West Midlands Performance Centre. This annual event’s first week, saw in excess of 40 badminton players, aged from as young as three years old to a gentleman in his thirties, participate in the badminton Summer Camp. The first week was run over four days and not only included routines, covering the different shots, lift, drop, net etc…. it covered singles and doubles rotation, technical advice to improve individual techniques, but I think for most the footwork to music was the biggest smash hit with all the players. Footwork to music was held in the impressive dance studio at the Sport and Fitness Centre, even for all passers by to see from Edgbaston Park Road. The two hour session was lead by Julia Mann (England and GB coach) who demonstrated each routine for the players to follow and practice. There are still two weeks left of the Summer Camp w/c 14th and w/c 21st. Now with only limited places left. If you are quick booking forms can be found HERE.